Have you ever thought about how large and oddly shaped works of art are transported? For example, how to safely move a colossal marble sculpture like Michelangelo’s “David” or the Diana of Versailles? How about valuable Old Master paintings? To transport artwork of this kind is a challenging task that requires years of experience and customized approach. Moreover, it is not only about the very process of transportation but also about artwork packing, which is art by itself too. At Fine Art Shippers, we understand that very well and, therefore, in addition to our comprehensive fine art shipping services in NYC and London, we also offer in-house art packing and crating services of the highest quality. When it comes to the transportation of valuable and fragile art, no matter locally or internationally, a host of workers – from insurance agents to art handlers – share the common goal of protecting the artwork in transit. What does it mean? While each step of the transportation process is very important, to transport artwork safely, first and foremost, means to properly pack the item so that it could withstand any climate changes or mishandling event. Plus, to transport artwork safely is impossible without proper crating. This applies not only to museum-quality masterpieces, but rather to any work of art you are going to ship over a long distance. At Fine Art Shippers, we can transport artwork of any kind, even large and heavy sculptures of exceptional value. Moreover, we are experts in manufacturing custom wooden crates for international shipping of art and antiques, and we have fully-equipped warehouses both in New York and London to provide our clients with in-house art packing and crating services for any need. Our team of professional crate makers knows how to properly crate paintings, statues, sculptures, and other works of art, no matter their size and weight. For today, Fine Art Shippers services all of the United States and Europe, as we also have reliable partners in Asia, Africa, and Australia, which allows us to transport artwork worldwide. Besides, our company works with reliable customs brokers to make the entire process of transportation as smooth and hassle-free as possible. Whatever your fine art shipping or crating needs, you have come to the right place! 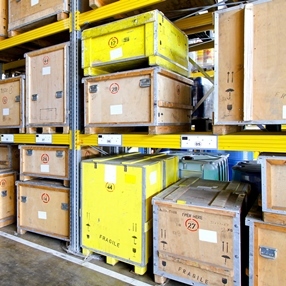 We will ensure that your precious collection is delivered to its destination safe and sound!